Properties in Museo Iglesia Santa Clara average 4.3 out of 5 stars. Property 2: Bogota Best Location!!! 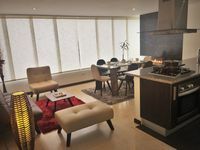 Bright and beautiful Penthouse, Usaquen! Property 3: Bright and beautiful Penthouse, Usaquen! Property 8: Beautiful Two-Level Apartment! Property 21: El Bosco Suites - "Paradise"
Property 29: Beautiful 2/2 , Located In The Best Area In Bogota !!! City Architectural Heritage: Spectacular Apartment! Property 37: City Architectural Heritage: Spectacular Apartment! Property 45: Downtown, Clean, Great View, Fantastic Location! Excellent location, clean and Juan Carlos very polite and ready to help me.